Ga-ga is a game from Israel that's a bit like dodgeball. Except there's one ball and it's considered to be the "kinder, gentler" version of dodgeball. When my kids described it, I figured it was one of those gym class inventions. Maybe it was, but from Israel and in Hebrew. It means touch-touch, but that also means that Lady Ga-Ga is Lady Touch-Touch, which is less ironic than Madonna also being the name of The Virgin Mary. From Wikipedia, I learned that Ga-ga came to America with Jewish youth camps in the 1960s. This does not explain its existence at a Lutheran school in Jacksonville. I also learned that besides New York in America, it also became somewhat popular in Australia. I know my kids didn't play it at a Lutheran school in the Kansas City area, nor a public school in Milwaukee. However, that reminds me of when I attended that same school (now MGIS and then 82nd Street School). My friends came up with a game that the older kids eventually named F@$& S#!^. I don't know why it had such a crude name, but it was like dodgeball, basketball, and soccer: You had to kick the hell out of the ball at the other team on the other side of the basketball court. If they caught it, you were out, but if they caught it in the face and dropped the ball, they were out. I think if you kicked one through the hoop, something good happened, like all your players out were back in. I don't know, we probably changed the rules weekly. Maybe Ga-ga is in Florida because of the sandy soil. The kids play it in a sand pit. In the past, maybe someone would have set up a horseshoe ring or a bocce ball court. 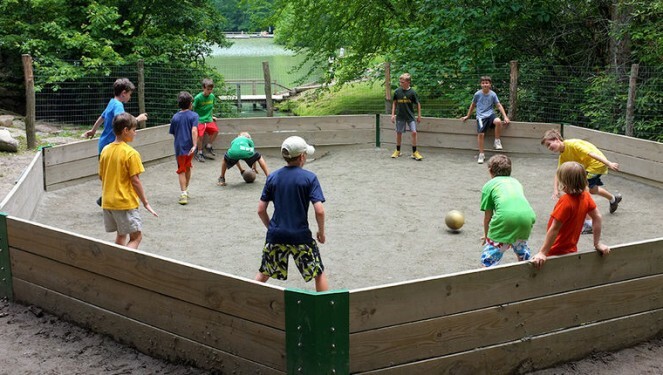 I'm cool with the kids playing a kinder, gentler dodgeball, though I do wonder whether or not that actually happens. I'm sure someone gets the idea that one ball isn't enough or that hitting others in the face is more fun than aiming for the ankles. The last time I played real dodgeball was in high school, and I ended up with a badly dislocated thumb, so I'm fine if Ga-ga is a little less intense. At least they're not playing the Mesoamerican ballgame or Australian-rules Football.